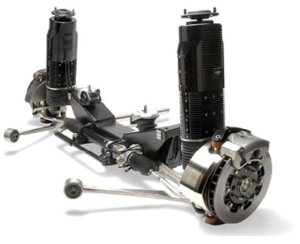 Every vehicle has a suspension system for it. The suspension is the part that holds the vehicle up, absorbs bumps, and allows it to steer. For the most part these systems wear out slowly, and with proper maintenance and periodic inspection they can be expected to experience only small, incremental problems. Sometimes the suspension will fail suddenly and dramatically and the vehicle will in effect fall down. This can be a couple of inches, until metal touches metal, and sometimes all the way only one or more wheels. This sort of sudden failure results when a spring or other weight-bearing part breaks, and is referred to as a collapse. Most spring collapses occur when the car or truck hits a bump, but it takes a very large or high-speed bump to break a normal, healthy spring. If you hit a pothole, you may notice an issue. This can do damage to your suspension or tires. Even if you do not think you did any damage, it is always best to bring it in. We can inspect to ensure that the parts are still efficient. This can help have a safer ride on the road. A spring that is greatly overloaded can break, but as with bumps, it takes greatly excessive load, usually far in excess of the vehicle’s load rating, to break a typical automotive spring that’s in good condition. Almost all automotive springs are made of steel, and all steel rusts to some extent. Rust and other corrosion is the combination of a metal with oxygen from the atmosphere. Corrosion greatly weakens steel, rendering the springs much more subject to collapse. Salt, particularly the salts used on roads in snowy areas, greatly increases the rate at which steel rusts. Other metal such as steel can experience other chemical changes over time. This entry was posted in Pothole damage, Potholes, Suspension, Wheel Alignment. Bookmark the permalink.